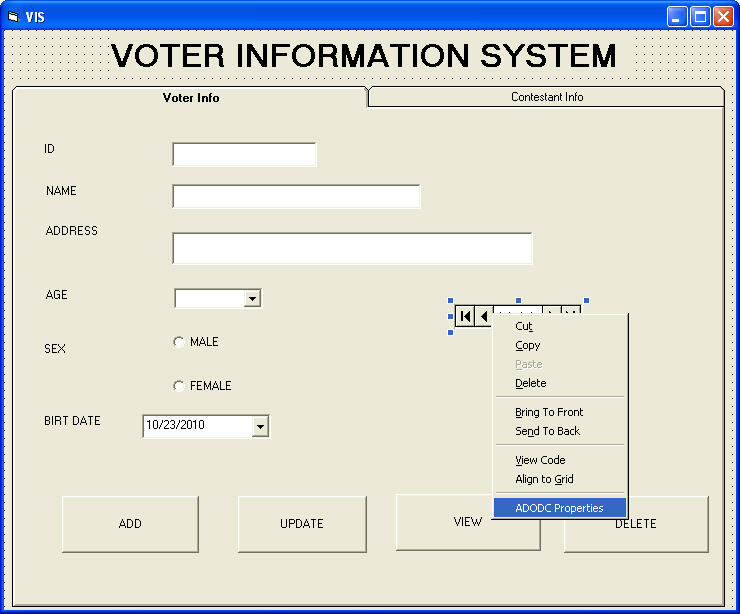 Here is a basic VB application called voter information system demonstrated which explains the concepts quite clearly. The first step required to establish connectivity is preparing the back end and the front end of the project. These steps are divided into two parts first the back end that is the oracle and front end that is the Visual Basic 6.0. Firstly we need to set up the database. Create the tables, triggers and procedures and database in the oracle. Develop the VB application as in this example given below. 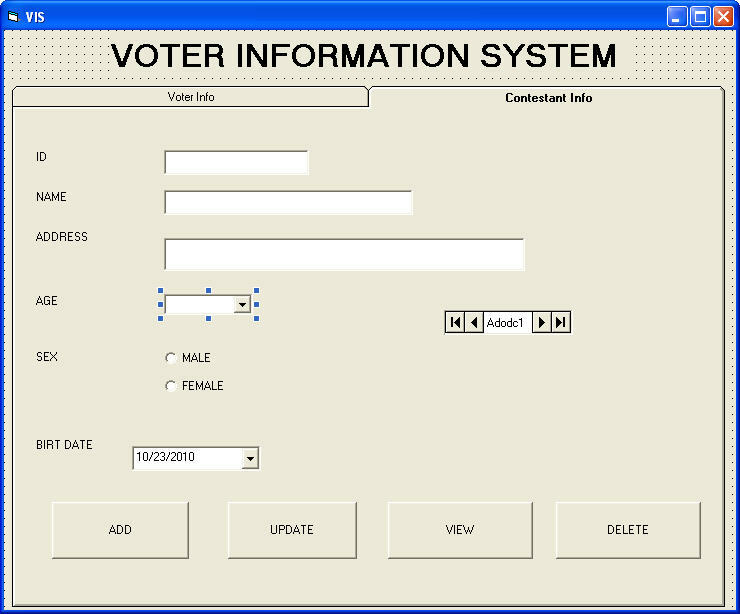 Design the necessary forms for the application. The next part is establishing the connectivity. 1) Right click adodc control -> properties. 2) Use connection string ->build. 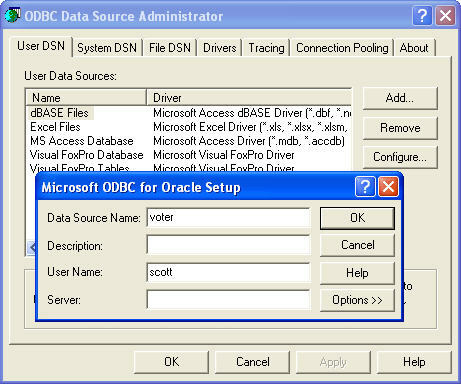 3) Select driver MS OLE DB provider for ODBC drivers -> next. 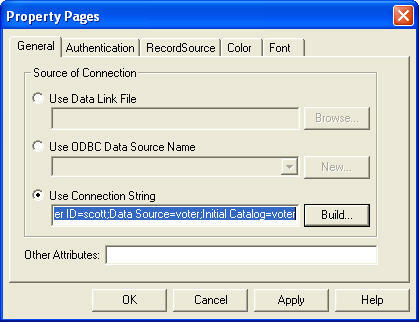 4) Select DSN table name voter from list. 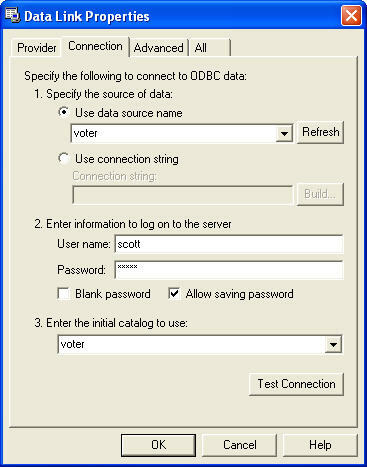 5) Type username and password “scott and tiger” which ever used for logging in oracle. 6) Allowing saving password -> test connection. -> if test connection successful then proceed else the check again the above steps. 7) Type catalog name same as table name. 8) Copy the string generated in use connection string. 9) Paste it in the connection to open. You have successfully set up connection with the Oracle Back End and VB Front End. Adding and retrieving records we will see in next part.